RPM4 Reference Pressure Monitor is different from traditional pressure monitors. 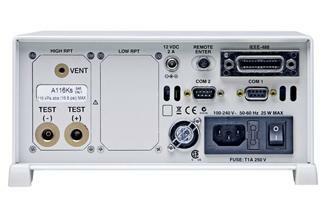 State-of-the-art performance from very low pressure to 280 MPa (40,000 psi)… advanced on-board features… compact and rugged… full local and remote communications… RPM4 is the perfect solution in a wide variety of high end pressure calibration, testing and measurement applications. Selects and activates the most appropriate Q-RPT to cover the specified range and measurement mode. Sets the pressure unit of measure. 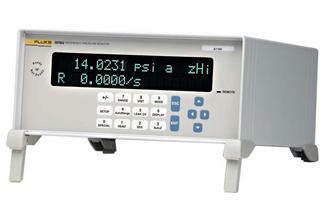 • Activates absolute, gauge or compound gauge measurement. Adjusts display resolution to the appropriate level for the range. Adjusts overpressure alarms to the actual range of operation. Reduces measurement uncertainty proportionally to the selected range (premium class Q-RPTs only). Note: The use of RPM4’s Infinite Ranging and AutoRange feature is recommended to optimize operation for a specific range but is not required to obtain “% of reading measurement specifications. All Q-RPT modules up to 7 MPa (1 000 psi) include the unique Self Defense System™ (SDS). SDS valves automatically isolate and vent the module's Q-RPT when it is not in use or an overpressure is about to occur. With SDS, any Q-RPT module can be left connected to pressure up to 10 MPa (1 500 psi) without needing to isolate or disconnect it. Special data such as pressure average over time, rate of change, hi/lo, freeze, deviation from set point. Differential mode directly measures the difference between two Q-RPTs including taring at the line pressure. Parallel measurement uses two Q-RPTs redundantly as one. Leak check measures average pressure rate of change over a user set time period. AutoTest automates calibration routines with tolerance testing and data logging. RPM4's outstanding pressure measurement specifications are made possible by Fluke Calibration’s exclusive quartz reference pressure transducer (Q-RPT) modules. Q-RPTs measure pressure by measuring the change in the natural oscillating frequency of a quartz crystal with pressure induced stress. To be qualified for use in a Q-RPT module, each transducer is individually evaluated and characterized using primary pressure standards. Only transducers exhibiting required levels of linearity, repeatability and stability are selected. A proprietary compensation model, derived from more than 15 years experience with thousands of quartz pressure transducers, is applied to optimize the metrological characteristics needed in a transfer standard. Standard and premium class Q-RPT modules are available to best fit your performance and budgetary requirements. 1 BA100K is a barometer with a low point of 70 kPa (10 psia). 2 BG15K is bidirectional gauge from - 15 to + 15 kPa (- 2.2 to + 2.2 psi). RPM4 can be used as an external reference pressure measurement device for a Fluke Calibration PPC4, fully automated, pressure controller/calibrator. One RPM4 can be connected to PPC4 by 9-pin RS232 cable. The RPM4's Q-RPT(s) become part of the PPC4 system and are managed by the PPC4 transparently to the user. There is only one test connection for the PPC4 system's full range of operation. Predicted one year stability limit (k=2) assuming regular use of AutoZero function. Absolute mode predicted one year stability without use of AutoZ is ± (0.005 % Q-RPT span + 0.005 % of reading). QRPT’s A200MN to A280M (30,000 to 40,000 psi). Combined linearity, hysteresis and repeatability. Add ± 1 Pa (0.00015 psi) in gauge mode with an Axxx Q-RPT for the resolution and short term stability of the on-board barometer. Maximum deviation of the Q-RPT indication from the true value of applied pressure including precision, predicted one year stability, temperature effect and calibration uncertainty, combined and expanded (k=2) following the ISO “Guide to the Expression of Uncertainty in Measurement. % of reading value times measured pressure from 100 to 30 % of Q-RPT span. Under 30 % of Q-RPT span, % of reading value times 30 % of Q-RPT span. For example, if the QRPT is a Standard A160K, the Measurement Uncertainty in pressure is 0.010% times the measured pressure to 48 kPa (160 kPa span x 30%) and 0.0048 kPa (160 kPa span x 30% x 0.01%) under 48 kPa. % of reading value times measured pressure from 100 to 30 % of AutoRanged span. Under 30% of AutoRanged span, % of reading value times 30% of AutoRanged span. If AutoRanged span is less then 30% of maximum Q-RPT span, % of reading values times measured pressure, or % of reading times 9% of Q-RPT span, whichever is greater. For example, if the Q-RPT is a Premium A160K and AutoRanged span is 160 kPa, the Measurement Uncertainty in pressure is measured pressure x 0.008% to 48 kPa (160 kPa AutoRanged span x 30%) and 0.0038 kPa (160 kPa span x 30% x 0.008%) under 48 kPa. If the AutoRanged span is 100 kPa (greater than 30% of 160 kPa maximum Q-RPT span), the Measurement Uncertainty in pressure is measured pressure x 0.008% to 30 kPa (100 kPa AutoRanged span x 30%) and 0.0025 kPa (100 kPa span x 30% x 0.008%) under 30 kPa. 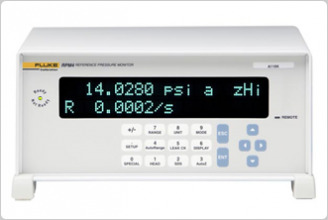 If the AutoRanged span is 30 kPa (less than 30% of the 160 kPa maximum Q-RPT span), the Measurement Uncertainty in pressure is measured pressure x 0.008% to 14.4 kPa (160 kPa maximum Q-RPT span x 9%) and 0.0012 kPa (160 kPa maximum Q-RPT span x 9% x 0.008%) under 14.4 kPa. mhhhac indicates the Hi Q-RPT designation. mlllac indicates the Lo Q-RPT designation and class. Leave blank if there is no Lo Q-RPT. See Q-RPT and ranges table under Features for available Q-RPTs. Hydraulic pressure generator - Includes: 1 qt. Di-2 Ethyl Hexyl Sebacate (synthetic oil), External tubing/adaptors for connection to a PG7302 or RPM4, and Operation and maintenance manual. Interconnections Kit - connect PG7102 to PPC or MPC pressure controller, and device under test.